The Harrison Fire Department will open its doors to area residents so they can learn about what it takes to be a volunteer firefighter in their community as part of the sixth annual RecruitNY statewide initiative. Over the last several years, it has been very tough for many fire departments throughout New York State to recruit and retain volunteers for a variety of reasons. Like most volunteer fire departments, the Harrison Fire Department needs to bolster its emergency responder numbers so it can continue to provide the optimum level of protection for its residents. 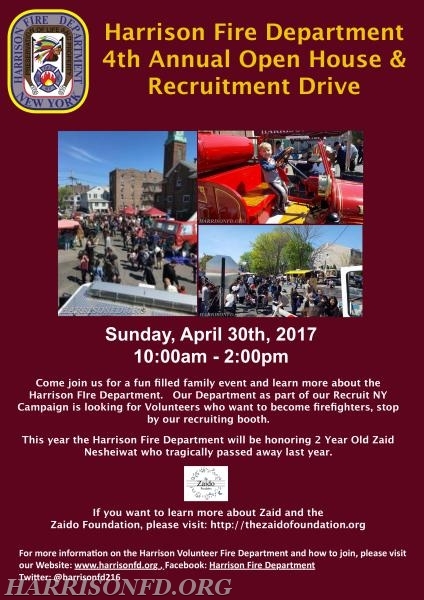 As part of RecruitNY, on Sunday, April 30th from 10am-2 pm, the Harrison Fire Department, located at 206 Harrison Ave, Harrison NY, will join volunteer fire departments all across the state at their respective firehouses for a unified recruitment drive as part of National Volunteer Week 2017. Not only will RecruitNY be an opportunity to highlight the duties and rewards that come with being a volunteer firefighter, it will also raise public awareness about the need for volunteers. Throughout the day, the Harrison Fire Department will conduct tours of the station and firefighter apparatus, allow visitors to try on firefighter gear and provide activities and stations throughout the firehouse for visitors. The fire department will discuss the requirements to be a volunteer, as well as conduct demonstrations, answer questions and let visitors know how to get involved in the fire department.